Siege: Â© Copyright G. Nicholls 2010 Siege is a game that is in some contrast to the more open game of e.g. Wing and may give a game of manoeuvring. The broad idea of Siege came partly from the game of Chaturanga, but more so from comments made by an editor of this site - Joe Joyce. Details are as follows: The Players: The Players are named after the basic colour of the uniforms of their Armies and are: The Blue Commander who plays the Army of the Northern Alliance And The Grey Commander who plays the Army of the Southern Alliance Each Player may be assisted once during the game by his Adviser Timed by TigerClocks The Settings: The Rocky Lands, which surround the forested Hilltops Range. 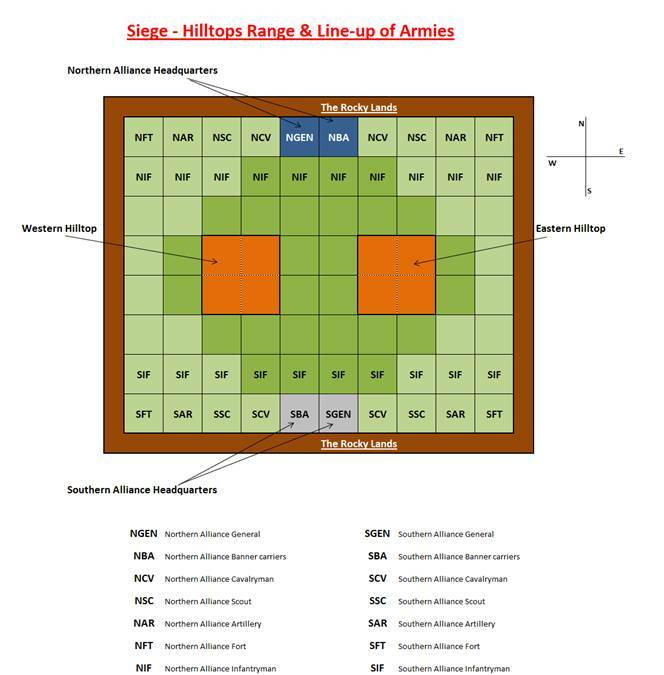 Within Hilltops Range are: â€¢ Western Hilltop â€¢ Eastern Hilltop â€¢ Northern Alliance Headquarters â€¢ Southern Alliance Headquarters The Board & Staff: The board consists of eight ranks and ten files though not all the positions (squares) can be used. The board is called the "Hilltops Range" board. The board with initial line-up, names and abbreviations of the Army Staff & equipment etc. (pieces) is as shown: Notes: â€¢ Squares are called positions. â€¢ The algebraic notation of the board is that files are designated A to J (West to East) and ranks are designated 1 to 8 (South to North). â€¢ The Hilltops, Headquarters and the darker green coloured positions are explained in notes and the section on moves and capturing powers of the Staff. â€¢ The colours on the Headquarters positions can be solid or bordered. Overview and Object: For several years the Rocky Lands has been at war with itself over a number of major political differences and there has formed two separate groupings, with armies, known as the Northern Alliance and the Southern Alliance. There have been a number of inconclusive battles with only small parts of their armies, but now the major parts of the two armies have met at Hilltops Range (whose residents are themselves split on allegiance but do not take part in the battle) in what is the decisive battle of the war. The object of each Player is either to Checkmate the opposing General or to Capture Enemy Headquarters with their Banner carriers - achieving either wins the battle. A Note on the Hilltops: The Hilltops are both high and almost vertical on all sides and are insurmountable without specialised equipment and so they are unusable by either set of Army Staff. These two areas therefore act as an edge to the board in their effect on how Staff and equipment etc. (pieces) move. The Hilltops cannot be occupied at all and they, or any part of them, cannot be moved over or captured over. Examples of this are given in the section on moving and capturing powers. A Note on Headquarters: Each Headquarters has been set up by the General and are the same as any other usual positions and have no effect on the moves or captures of any of the pieces except for the Banner carriers (explained in the section on moving and capturing powers). Moves & capturing powers of the Staff, equipment etc. : Note: Other than the Hilltops' restriction only the Banner carriers are restricted in their use of the board. A General is similar to a General in Chinese Chess except that he is not confined to a Fortress. He can move to or capture on one position vertically forwards or vertically backwards or one position horizontally. A General must not remain under attack (check) if it is possible to escape the attack and he may not move into an attack, also no moves or capturing moves can be made by his own pieces which cause him to be placed under attack. The two Generals may stand on diagonal positions next to each other as neither attacks the other in this situation. There is no Castling type move in Siege. The effect of the Hilltops is that a General can move or capture along them with moves e.g. D3 to C3. Banner carriers are a group of men who carry the Banner of each Army though they and their Banner only occupy one position on the board and are treated as one piece. They can move to an unoccupied position that is one position diagonally forwards or an unoccupied position that is one position vertically forwards. They have no powers to capture opposing pieces, or to Check the opposing General, except that they can capture the opposing group of Banner carriers with their usual move. Since if one carrier were captured the rest of the group would carry on, the group (piece) cannot be captured except by the opposing General (who takes the entire group as prisoners) or as already stated by the opposing Banner carriers (who also take the entire group as prisoners). If the Banner carriers reach and occupy either position of the enemy Headquarters then they have Captured Enemy Headquarters and this wins the battle - it makes no difference if the position they have reached and occupied is under attack, even by the opposing General, and it makes no difference if the other position in the enemy Headquarters is occupied or not. If the Banner carriers are captured then the difference to the battle is that their Army then only has Checkmate as the winning objective. The Banner carriers have been given the mission of Capturing Enemy Headquarters and must stay on positions which enable them to reach enemy Headquarters and these are shown on the diagram of the board in a darker green and so the Banner carriers cannot move outside of these darker coloured positions (except to Capture Enemy Headquarters) - it can be seen that some of these positions can only be reached by one of the groups of Banner carriers. To re-state: Banner carriers can only capture the opposing Banner carriers and the only other piece that can capture Banner carriers is the General. The effect of the Hilltops is that Banner carriers can move or capture along them with moves e.g. for the Southern Alliance Banner carriers, E4 to E5 or across the diagonal edge with moves e.g. C3 to B4. A Cavalryman is identical to a Knight in Western Chess He moves to and captures on any position that lies two positions vertically (forwards or backwards) or horizontally to him and one position laterally in relation to this, or the move can be considered in other ways that lead to the same destination position and, as he can leap, any intervening Staff have no effect on the move or capture. The effect of the Hilltops is that a Cavalryman can move or capture around the outside of them with moves e.g. C3 to E4 or to B5. The Hilltops have dotted lines to help show which moves or captures are possible and what moves or captures would not be possible for a Cavalryman e.g. G3 to H6 is not possible. A Scout is identical to a Bishop in Western Chess. He can move to any unoccupied position on an unoccupied diagonal path backwards or forwards but cannot jump over any other piece to do so. He can capture the first opposing piece along any of these paths provided none of his own pieces block the path first. The effect of the Hilltops is that a Scout will have his moving and capturing path cut off short in many positions, e.g. on D3 a Scout cannot move or capture to B5 or A6 though he can move or capture across the diagonal edges to E4, F5 or G6 etc . Artillery is identical to the Cannon in Chinese Chess. An Artillery piece can move to any unoccupied position on an unoccupied horizontal or vertically forwards or backwards path but it cannot jump over any other piece to do so. An Artillery piece can capture along one of these paths by jumping over a single piece of either side (called the screen) to capture and replace the opposing piece which must be the next piece along the path after the one being jumped over. The effect of the Hilltops on the move of Artillery is to cut the move off short e.g. from E5 it can only move horizontally to F5 though it has the full range of vertical moves along the E file as it can move along the sides of the Hilltops. The height of the two Hilltops is too much for the trajectory of the Artillery to fire over and so capturing moves are cut short e.g. an Artillery piece onC1can only vertically capture on C3 (if C2 is occupied) though the full horizontal 1st rank is here available for capturing. Capturing can take place along the side of a Hilltops e.g. Artillery on D3 can capture all along the 3rd rank. A Fort is identical to the Rook in Western Chess and the Chariot in Chinese Chess. A Fort can move to any unoccupied position on an unoccupied horizontal or vertically forwards or backwards path but it cannot jump over any other piece to do so. A Fort can capture the first opposing piece along one of these paths provided none of its own pieces block the path first. The effect of the Hilltops on the move of a Fort is to cut the move or capture off short e.g. from H7 it can only move or capture vertically to H6 or H8 though it has the full range of horizontal moves and captures along the whole 7th rank and a Fort would have the full horizontal range of moves and captures along the whole 6th rank if positioned on H6 as it can move or capture along the side of a Hilltops. An Infantryman differs from the Pawns of Western Chess or the Soldiers of Chinese Chess. He moves or captures one position diagonally forwards except on his first move he has the option to move, but not capture, two positions diagonally forwards to the 4th rank and the first diagonal position must also be unoccupied as he cannot jump. Upon reaching his eighth rank an Infantryman can be exchanged for one of the following of his side's pieces that is taken prisoner/captured: 1. A Fort 2. An Artillery piece 3. A Cavalryman 4. A Scout If a Scout then the Scout's original diagonals must match with those of the Infantryman's (both are "colour-bound"). If no piece of the above is available then the Infantryman is promoted to a senior Infantryman (abbreviation NIsen - Northern Alliance or SIsen - Southern Alliance) and he can now move to or capture on one position diagonally backwards as well as diagonally forwards though he does not have any first move option of a two positions move. Where one or more pieces are available to exchange, a Player can still choose to promote the Infantryman to a senior Infantryman, but the Infantryman is not allowed to remain as an Infantryman. The effect of the Hilltops on the move of an Infantryman or a senior Infantryman is that they can move or capture across the diagonal edges e.g. from G3 to F4 or C2 to E4 (first move). Also some Infantryman cannot make a two position first move e.g. the Infantryman on B2. General rules & notes: The game is played mostly with generally accepted rules and best practice of Western Chess; the following apply: 1. Points are three for a win by Checkmate, two for a win by Capturing Enemy Headquarters and one for a draw. 2. The Southern Alliance moves first and then moves are played alternately by each side. 3. Each Player may confer with his Adviser once during the game. This must take place away from the playing area and whilst the Player being advised has the move and so the time is then charged to his/her clock. The Adviser to the Blue Commander is called the Blue Adviser and the Adviser to the Grey Commander is called the Grey Adviser. A Player does not have to appoint an Adviser. 4. The basic colour of the Northern Alliance pieces is dark blue and the basic colour of the Southern Alliance pieces is mid grey. 5. Draws are based on the rules for Western Chess and include Stalemate and threefold repetition of moves/position. 6. Players should state "check" if the opposing General is under attack, though this is not compulsory. 7. All captures of pieces result in the capturing piece occupying the position the captured piece was on. 8. The possibility of capture by en passant does not arise and so is not applicable. 9. Should the move to Capture Enemy Headquarters also deliver Checkmate then the result is classed as Checkmate as is the score. 10. The Banners are plain coloured and are of the colour of their sides as stated above i.e. dark blue and mid grey. The Banners are the same on both of their sides. Flags are flown at the front and centre of each side's Headquarters and are smaller versions of their Banners.